"This is a great sweet and salty way to serve salmon. Easy enough for the beginner and a family favorite!" Season salmon fillets on both sides with salt and pepper. Heat olive oil in a large skillet over medium-high heat. Cook salmon fillets until flesh flakes easily with a fork, 5 to 6 minutes per side. Combine honey, water, brown sugar, sriracha sauce, soy sauce, and garlic in a small pot over medium heat; bring to a boil. Cook, stirring frequently, until glaze is thick and smooth, 5 to 7 minutes. Pour glaze over salmon fillets. 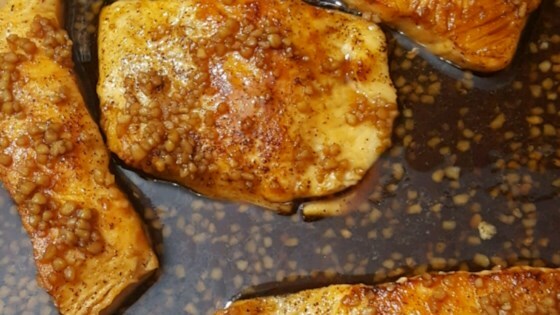 See how to make simple broiled salmon with a sweet and spicy glaze. The glaze wasn't as thick as I would like. I would try leaving out the water next time. I doubled the recipe and had some extra sauce to go on rice. Yum! This was really good! Left out the Siricha sauce and reduced the water by half, and it very tasty! Yes, I will make this again! Easy to prepare and delicious! Best taste and so easy! My hubby ate two helpings!